Wet the brushes and squirt a small amount of shampoo into the palm of your hand. Wash one brush at a time in the palm of your hand using a back-and-forth motion - this is really important, because using a swirling or circular motion will cause the brush fibers to twist around eachother and break. Rinse under flowing water and gently squeeze out all excess moisture, ensuring that the water runs clear out of the brush. Reshape the brush and lay on a towel or the side of your sink and let dry. At least once a week, spritz your brushes with an anti-bacterial brush spray to keep bacteria at bay. 2. Stick to a Skin Care Routine. This one is especially difficult for beauty junkies like myself. Avoid buying into the hype of new and exciting skin care products and stick to a regular routine of cleansing, treating (if necessary), moisturizing and using SPF during the day. Remember that it takes at least 6 weeks for a product to really work, so be patient and stick with it. Plus, constantly changing your routine can aggravate your skin and lead to sensitivity, acne, and clogged pores. So, be patient and stick with it - your skin will thank you! 3. Use natural lip products. 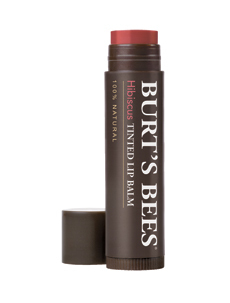 Burt's Bees - these tinted lip balms provide the perfect amount of color and hydration in an all-natural formula. 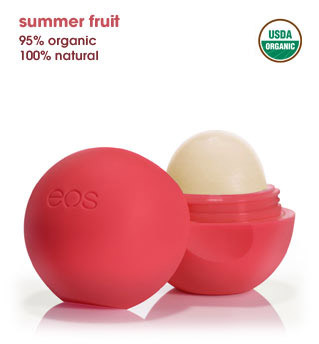 How cute are these tiny little spheres from EOS? They taste great and are super hydrating. Plus, they're easy to find in your purse. These lipsticks from Real Purity contain all natural ingredients along with a high level of pigment in fun, funky colors. 4. Put Down the Tweezers. ... and pick up an eyebrow pencil! We've seen it for the past two seasons, and I think they're here to stay: bold brows. So put down the tweezers and embrace your beautiful, full arches! I love this look; bold brows are so youthful-looking and really frame the eyes. To perfect your arches, trim any stray or long hairs, and use a brow pencil to fill in an sparse areas by using short, light strokes in the direction your hairs naturally grow. Brush through with a clean mascara brush, add a little highlighter under the arch, and you're good to go!